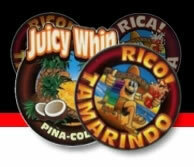 Juicy Whip produces the best selling Mexican fountain drink line in the U.S.
40 Million Hispanics drink JuicyWhip products. Juicy Whip's HORCHATA was the first commercially available Hispanic fountain drink in the U.S.
Pasteurized to provide a 9 month shelf life when kept at room temperature. 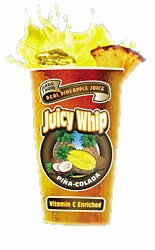 Juicy Whip's Pina-Colada whipped drinks are the best selling flavors in non-Hispanic areas. Juicy Whip products offer the most authentic taste and texture of any beverage concentrates available in the market. Rica Horchata – Juicy Whip offers a very creamy, rich Horchata featuring fresh ground "Korintji" cinnamon and vanilla flavoring. Our special Horchata blend is pasteurized for quality assurance, and to extend the shelf life at the customer’s fountain. In fact, Juicy Whip is the only major Hispanic concentrate manufacturer in the industry that offers a pasteurized Horchata meeting the strict government health standards for high pH fountain beverages. Rico Tamarindo – Fresh Tamarindo from Mexico is specially cooked from scratch in our plant to release the unique sweet tart juice from the pulp. The solids are separated, and the freshly extracted juices are used to produce a lively, refreshing drink. 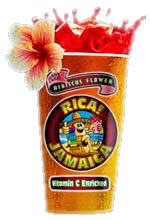 Rica Jamaica – Juicy Whip takes special care in cooking the native Hibiscus flowers from Mexico to extract the delicate juices for the formulation of this thirst-quenching, flavorful Latin drink. beverages. Pina Colada – Full-bodied, flavorful and refreshing blend of juicy Valencia oranges, or fresh pineapple juice and coconut, delicately formulated to maintain the rich taste of the fruits in every drink. Juicy Whip concentrates offer the highest content of "real fruit" in the whipped fountain beverage industry today. We ship anywhere in the U.S. and there is no minimum, just full cases only. Call for prices and shipping. We ship anywhere in the U.S.
• Mexican Restaurants – From small taquerias to formal Mexican dining, including restaurants offering a mix of Mexican food items along with traditional American foods. • Convenience Stores – JW has provided beverages to the major C-Store chains in the U.S. since 1990, and is currently the only corporate approved supplier of BIB Horchata to BP/Arco, Circle K and 7-Eleven. • Hispanic Supermarkets/Delis – If foodservice is available, Mexican beverages will be part of the menu. • Mobile Catering – A large number of mobile catering companies in Southern California now offer JW’s Horchata as part of their standard Hispanic menu. • Hotels, Casinos, Convention Centers and other Institutional Service Operations – Most of these applications employ a large percentage of Hispanic workers, and offer the traditional Mexican beverage choices in their employee dining rooms as an important employee benefit. • Swap Meets – The Hispanic culture has traditionally used open air markets as a primary shopping medium, and foodservice is a big part of the attraction. • Entertainment/Sporting Event Venues – Soccer, boxing and baseball venues are popular Hispanic entertainment choices, along with programs featuring Mexican music and dancing. 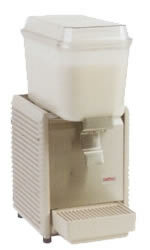 The Bubbler by Crathco is one of the ways that you can dispense your Hispanic Products. 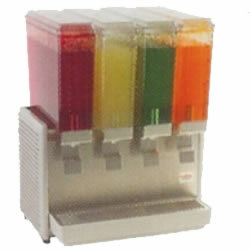 Your low cost option to postmix juice machines. All Stainless Steel construction for heavy duty commericial use. Surfaces easily wipes clean. No coils, no domes. 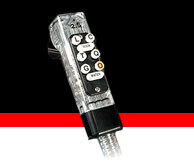 Hispanic products are also able to be dispensed through bar guns.